Gościem IV Europejskiego Kongresu Mobilności Pracy była tradycyjnie Marianne Thyssen, Komisarz UE ds. Zatrudnienia, Spraw Społecznych i Umiejętności. Zachęcamy do zapoznania się z zapisem przemówienia, które Pani Komisarz wygłosiła podczas tegorocznej edycji. It is a pleasure to be back in this beautiful city of Cracow. 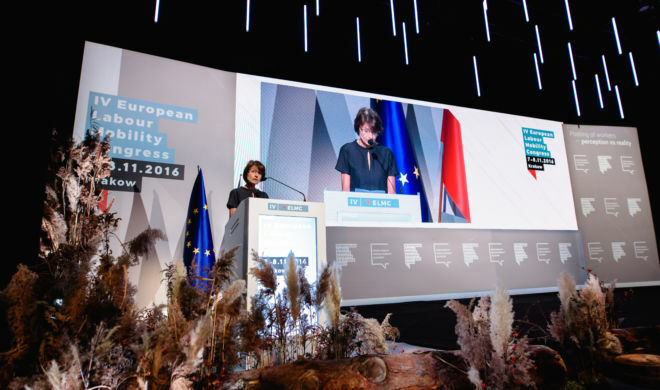 It was here, in Cracow at the European Labour Mobility Congress in April of last year, that I had the honour to set out for the first time my vision for a deeper and fairer internal market…; a vision for more labour mobility and more posting of workers – based on clear, fair and enforceable rules. and we have published a report on the results so far of the Youth Guarantee, our strategy, in cooperation with the Member States, to get more young people into a job or training. All those initiatives have a common goal – and that is to ensure that economic development and social progress in Europe go hand in hand. When talking about economic and social policies in Europe, some people argue that the European project is purely of an economic nature, that it is only about economic integration – and that social considerations, at most, should play a secondary role. But that is not what the Treaty on the European Union says. In its preamble, the signatories solemnly stated that they are „determined to promote economic and social progress for their people”. And Article 3 of the Treaty says that „The Union’s aim is to promote peace, its values and the well-being of its people” and that „The Union shall work for the sustainable development of Europe based on balanced economic growth and price stability and a highly competitive social market economy, aiming at full employment and social progress…”. If well designed, economic and social policies are mutually reinforcing. It is in the first place for the Member States to determine their labour market rules and to design their social systems. Each Member State has its own history and traditions. Labour market conditions, including wages, reflect local economic circumstances and are, hence, naturally different between Member States. Let me be very clear: the aim of the Commission is by no means to artificially impose uniform wages across the EU. On the contrary, we systematically underline the importance of having wages evolve in line with productivity. That implies that we recommend some countries – like the Czech Republic – to increase wages, whereas we recommend others – like Portugal – to moderate wages. But we do believe that in order to promote economic and social progress, it is important to have certain minimum standards of social protection in place across the Union. Minimum rules on safety and health of workers for example. And minimum standards for social protection and social services. Those standards are minimum standards. Member States are free to guarantee higher levels of protection on their territory if they so wish. That is an important principle of EU social law and a matter of subsidiarity. And if Member States have such higher levels of protection in place, they should be able to uphold them, also in the Internal Market. That is not protectionism – it is a matter of safeguarding upwards instead of downwards convergence in the Internal Market. And that brings me to my proposal from the 8th of March for a targeted revision of the Posting of Workers Directive. The central element of my proposal is that I want the same binding rules on remuneration for local and for posted workers; and the same binding rules on remuneration for local and cross-border service providers. This is fair for workers and for businesses. First, it does not necessarily mean the same pay for everyone. If an individual worker manages to negotiate better conditions than what his employer is legally bound to pay – good for him! And if an employer wants to reward an individual worker with a salary raise when he is legally not obliged to do so – excellent! Secondly, the yard-stick is clear. It is not ‚average pay’ or ‚the pay of a hypothetical worker’. It is what that particular worker, as a minimum, is entitled to under the binding rules of the host country. And thirdly, this will not make things more complicated or uncertain for posting businesses compared to the situation today. I notice that there are a lot of misunderstandings about the current system, which is sometimes misrepresented – as if today only statutory minimum wages would apply. Under the current rules, employers also need to verify the details of collective labour agreements in the host country. They also need to classify their individual workers in the pay grids contained in those collective labour agreements. The Court has clearly confirmed this last year in a case launched by a Finnish trade union. The host Member State will be obliged to publicize on a single website what are the constituent elements of remuneration. The Court has clarified that employers are only bound by rules which are sufficiently transparent, so if a host Member State fails to publicize the information, a posting firm will not be bound by it. My proposal will hence bring more legal certainty and more transparency, building on the case law of the European Court of Justice. Frankly, I don’t see how this could be against the interest of posting firms. Let’s take a look then at the economic impact of the proposal. The number of posted workers across the EU has increased almost threefold since 2007. In 2014 we were close to 2 million posted workers. Preliminary data for 2015 indicate a further increase. A steep upwards trend and that is excellent news. It shows that our services markets are getting more integrated. Poland posts more workers than any other Member State – more than 400.000 workers per year. The improvement in their working conditions, which my proposal will bring, will directly benefit those workers and their families. Again, I don’t see why this would not be in Poland’s interest! Poland’s workers are first class workers. They are competent and motivated. And when they work in the West, they deserve to be paid according to Western rules. This is a matter of fairness and of dignity. As Commission we continue to work on removing obstacles to cross-border service provision. As part of our Skills Agenda for Europe, we are for example pushing for better recognition of professional qualifications and skills. It will pave the way for more cross-border service provision in the future. We also know that demand for specialised skills and manpower is here to stay. Demand for cross-border services is driven by skills shortages and specialised labour as much as by labour cost differentials. In fact, labour costs motivate only about one-third of total postings. The experience of recent years shows that posted workers predominantly follow economic growth and demand for service. For example, in 2014, five countries received over 65% of the total posted workers – and about 80% of the workers posted from the East. Those countries are Germany, Austria, the Netherlands, Belgium and Sweden: incidentally, the countries that have better withstood the crisis and whose economic growth has generated demand for services which local markets could not meet. Notwithstanding the considerable growth potential, I do understand, however, the concerns of small enterprises about their costs and profit margins. Will they still be competitive abroad if they have to pay higher gross wages to their workers? That question cannot be answered with a simple yes or no. It will depend. Research of the Labour Mobility Initiative, suggests that wages paid to Polish posted workers are on average above the minimum wage in the host country. If you add the per diem allowances for costs specific to posting, you may well end up very close to or even above what binding rules on remuneration in the main hosts countries require. Moreover, evidence suggests that higher wages can lead to higher productivity and therefore the total project costs for an SME may remain the same or be even slightly lower. And last but not least, it will depend on how Polish SMEs adjust. Will some of the least efficient and least productive SMEs – who will be facing the biggest challenges – succeed in increasing their efficiency? If so, this will benefit the competitiveness and the productivity of the Polish economy as a whole for the years and decades to come. Personally, I would tend to think that a model of competition in Europe based purely on low labour costs is not in the interest of Polish SMEs. Polish wages are not the lowest in Europe. And where social security contributions are at 18,3% in Poland, they are as low as 6,6% in Malta. Under those circumstances, cut-throat competition from lower labour cost countries will knock on the door of every company, including here in Poland. Will Polish businesses establish abroad and will this lead to a brain drain, is another legitimate question? Polish businesses might indeed establish local branches in the West and recruit from there to save on transport and lodging costs. But why is this such an unattractive prospect? I hear people complain sometimes about Western companies with branches here in Poland repatriating profits made in Poland to reinvest at home. Why should Polish companies not do the same? The freedom of establishment too is one of the fundaments of the internal market. And about brain drain, if a young woman in Poland, who graduates from nursing school, can go and work at a hospital in Copenhagen at Danish wages, or be posted to that same hospital by a Polish temporary work agency at Polish wages, which option do you think she will choose? Better employment conditions for posted workers can encourage people to look for a job here, instead of moving abroad and can hence shield the Polish labour market from brain drain. It will of course be for the Polish Government to determine its position in the Council and for the Polish members of the European Parliament to represent the Polish citizens, who have elected them, in the democratic debate. They are best placed to assess what is in the interest of Poland. And I invite them to help shaping the new rules on posting in a constructive way. Finally, let me say a few words about enforcement. Businesses rightfully attach a lot of importance to legal certainty, to clear and transparent rules, rules which are respected and enforced on the ground. It is a common aspiration of all honest business – and I really believe that the vast majority of businesses are honest, in the West and in the East. We are making a lot of progress on this front in Europe. The Enforcement Directive on the posting of workers from 2014 is an important tool and I congratulate Poland for having notified full transposition within the deadline, as 14 other Member States have in the meantime done as well. We have launched infringement procedures against those Member States that have not fully transposed the Directive yet and you can count on me to keep the pressure high. A crucial element of the Enforcement Directive are the new tools for better cooperation between Member States’ enforcement authorities. I am satisfied to see the cooperation intensify every year: bilateral agreements are concluded, electronic tools for data exchange are rolled out, best practices are spread. The fight against abuses in the form of letter-box-companies or undeclared work is a common challenge for sending and receiving countries. They can tackle them effectively only by joining forces. Another important task for public authorities is to provide informationto workers and businesses about their rights and obligations in cross-border situations. For prevention is always better than cure. Information should be provided not only to those who arrive but also to those who are posted abroad. More than 400.000 people a year in Poland. It is important that those workers are aware of their rights and that trade unions and public bodies help them enforce their rights, at home as well as abroad. The road transport sector is a sector in which enforcement of the rules gives rise to a lot of difficulties and friction. As you know, the European Commission has launched infringement procedures against Member States who implement the posting rules in this sector in a disproportionate way. Legally, there is no doubt that the Posting of Workers Directive applies to international transport operators. No sector, other than the merchant navy is excluded from the scope of application of the Posting Directive. However, we are aware that there is a need to tailor rules to the reality of such a highly-mobile sector, and to avoid the recurrence of cases similar to those in Germany and France. Transport Commissioner Bulc and I are working towards a set of fair, clear and enforceable rules for companies and workers operating in this sector – a sector which is so crucial for the European economy. A public consultation on social legislation in the road transport sector will be open until 11 December. We are looking forward to receiving your insightful inputs in view of the preparation of the Road Transport Package, which we plan to adopt before summer 2017. I believe that businesses across the EU will continue to compete on the quality of their products and services; and on their productivity and specialisation; as is the case already today. Their comparative advantage and competitive edge is based on this quality and innovation; it is not based solely on cheap labour costs. Our proposals put forward a sustainable model of fairness and balance, geared to promoting productivity and decent work standards. I firmly believe that this revision is in the interest of a level playing field in our Internal Market. It will enable businesses to operate in a stable and certain legal framework – one with rules that are fair and clear for all. The combination of the revision of the Posting of Workers Directive, of the Regulation on social security coordination which we will launch in the coming weeks and of a new Road Transport Package will set the legal framework for the years to come. Poland’s contribution is crucial, in both European Council and Parliament, to shape the rules of the game in the most effective and meaningful way. The Commission is not shying away from debate and my presence here bears witness to that. I have engaged in dialogue with a number of stakeholders, not least with national Parliaments – most recently a few weeks ago, in an enlarged meeting of the European Parliament. The fact that we have maintained our proposal despite the Yellow Card does not mean that we have ignored the political reasons that lay behind. It means that subsidiarity concerns were unfounded for, what is, by definition, a cross-border issue. I believe that this conference provides us with an opportunity to build on the areas where we agree – for example, on the importance of labour mobility itself. It also offers us a platform to openly discuss the issues where our views diverge. What is essential is that we seize this chance to form a common understanding and that we build together a Union where economic development and social progress go hand-in-hand. Martina Dlabajova: "Nowelizacja dyrektywy nie może dzielić państw na zwycięzców i przegranych"